Today I am excited to offer Earthwise Medicinal’s first tea blend: Elderberry Echinacea Immune Tea, now available in 4oz packages! This tasty tea gently stimulates and supports the immune system and when steeped, turns a lovely deep-rose color. 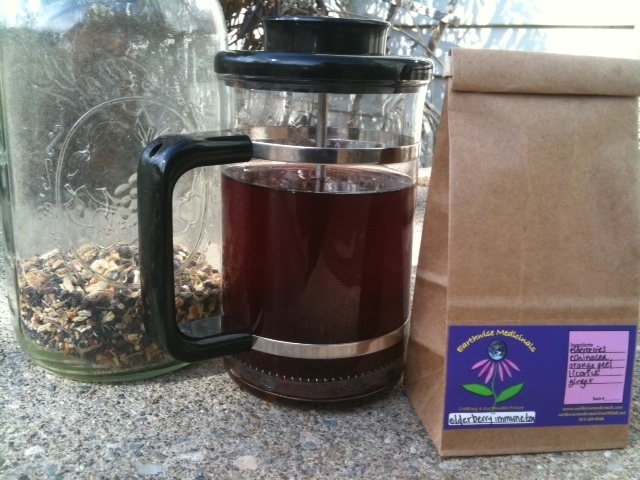 Elderberry tea is delicious just about anytime. This blend has a naturally sweet flavor and therefore requires no additional sweetener- making it a great choice for kids. This tea can and should be steeped twice for added value (just pour another pot of boiling water over herbs a second time and steep for 10 minutes). This is my go-to recipe whenever I feel slightly run down, a scratchy throat, or an oncoming cold. Often when I use this tea in conjunction with miso soup, extra rest, raw garlic pesto, and facial steams with essential oils, I am able to fight off oncoming cold symptoms before they set in. I hope you will enjoy this hand-crafted tea blend! How do I order it and how do I make it?